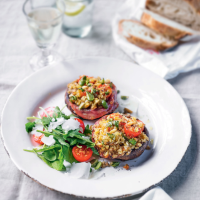 These lovely juicy mushrooms make a great starter or light lunch, and can be prepared in advance. Italian olives and fennel salami give a wonderful Mediterranean twist to the dish. 2. Heat 1 tbsp oil in a frying pan, and fry the chopped stalks, onion and pine nuts for 4-5 minutes. Add half the tomatoes and all the olives, and fry for a further 2-3 minutes. Stir in the breadcrumbs and season. 3. Place 2 slices of salami on each of the mushrooms, then spoon on the breadcrumb mixture and bake for 15 minutes. 4. Toss the rocket with the remaining tomatoes and oil, add the Parmigiano Reggiano, and serve with the stuffed mushrooms.